Glenavon's Dylan King (right) on the way to a clean sheet last weekend over Linfield. Pic by Pacemaker. Dylan King wants to crown a weekend Windsor Park clean sheet with another progressive performance when Glenavon face Dungannon Swifts in the Boxing Day derby date. 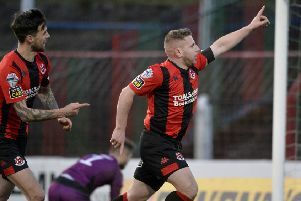 King was part of a backline that left Belfast on Saturday with a well-earned point in the clash between two of the Danske Bank Premiership’s high-flying rivals. Dungannon Swifts boss Kris Lindsay. Pic by INPHO. The Lurgan Blues’ festive demands now switch focus to Stangmore Park but also include Saturday’s visit of Institute before a New Year’s Day date when Glenavon welcome Warrenpoint Town. King is keen to ensure Glenavon do not suffer any loss of momentum entering New Year across three tests inside seven days against clubs rooted in the bottom six. “You need to show some ambition,” said King, who will face a Swifts side now managed by former Glenavon coach Kris Lindsay. “We cannot be up for a match at Windsor Park then not have that same attitude in other games. “It may be an advantage that Kris knows so well how we play but, when we do well what we can do, it’s so hard to stop. “Against Linfield, I thought we were brilliant as a team, it wasn’t that open but end-to-end. “We’ve been working in training on clean sheets as, in fairness, the boys up top have been creating chances and scoring goals. “For a squad looking to challenge and do well we know we’d been conceding too many goals. “We got back to basics about just defending balls coming into the box. “Linfield play with so much intelligence and you look away one minute and Andy Waterworth’s gone, so it takes total concentration. “But we are happy that focus paid off with a clean sheet. “I came in at the start of the season and played quite a few times, then was out for a few so need to keep on proving I’m worth my spot. Lindsay is looking for home comfort in response to the weekend 2-1 reverse at Coleraine. “It’s a massive game and I’m expecting a big crowd at it,” he said. “We know Glenavon’s qualities, we know how good they are going forward, so we’ll need to be on top of our game for 90 minutes to get a result. “We’re at home, and you need to win your home games in this league. “Our season will not be judged in games against teams at the top of the league, we need to beat the teams in and around us. “In saying that, it’s important we compete, especially at home. “If you win your home games against anyone in this league then you’ve a chance of moving up the table. “I didn’t think it would have taken for Coleraine to go 2-0 up for us to start playing with any tempo or desire. “We then played with that intensity, we closed the ball down well, we created chances. “But we can’t wait for teams to go 2-0 up for us to start playing like that, we need to be doing it for 90 minutes - but it’s up to me to get the players to do that.